"...Please click HERE for a sample ballot for the General Election to be held on November 6th. A sample ballot viewed or printed from this website is not an official ballot. To obtain an official ballot, you must go to a designated polling location ..."
"... Authorities are actively searching near the intersection of Cave Spring Road and Old Gurley Pike in connection to the disappearance of Warren Flippo. Flippo was last seen on June 24, 2000 and was..."
"...The fire is mostly put out. The Moores Mill, Keel Mountain, Gurley and Central volunteer fire departments reported to the scene. According to a Madison County worker, the land owner's employee was trying to burn debris and accidentally ..."
"...Madison County authorities closed Maysville Road from Bell Factory Road to St Clair Drive..."
"...Investigators tell us the house has a metal roof, which poses a challenge for firefighters because it holds in the heat and caused the fire to spread instead of keeping it in a central location ..."
"...Rachel, at the young age of 30. She was hit and killed walking on U.S. 72 on Chapman Mountain...hit by a car going 70 miles per hour...received a call Monday night about a woman walking in the middle of the street and they were on their way to check it out when they got the second call..."
"... victim was struck by a vehicle on U.S. 72 at Chapman Mountain around 9:30 p.m..."
"... Norfolk Southern is extending its road closure, through Thursday..."
"...Huntsville traffic alert! Work has begun at Moores Mill Rd near Jordan Rd at the RR crossing NorfolkSouthern is resurfacing the crossing the road is closed for the next day or so ..."
"...will affect customers found in the triangle of Highway 72 East, Dug Hill Road, and Wall Road. Maintenance will begin at 8 a.m. and ..."
"... Witnesses told police that Collier was driving erratically and almost hit a motorcycle as he approached the intersection of Highway 72 and Moores Mill Road. Collier did stop at the intersection, but stopped in the middle of the roadway. Johnson said when the light turned green, Collier accelerated and headed northbound. Norfolk Southern ..."
"...student admitted having a .22-caliber rifle in his vehicle...The Madison County Schools policy for firearms found on campus is a full year expulsion for the student in question..."
"...The Madison County Commission is looking to better regulate noise in the county. Commission members say they have received a variety of complaints from across the county ..."
"...A Madison County man stopped the theft of his utility trailer by shooting one suspect and blowing out a tire on the getaway truck, authorities said..."
"...one person is dead after an accident happened at the intersection of County Lake Road and Winchester Road on Tuesday morning just ..."
"...Officials say the victim has been identified as 78-year-old Jef Humphrey. The fire started around 3 p.m. at the home on Federal Lane near Winchester Road ..."
"... The Alabama Department of Public Health says it has received a report of Neisseria meningitidis, or meningococcus, at Scottsboro Junior High School. The health department says children at the school could have been exposed to the reported case, and they suggest for parents to make sure students are up-to-date on school vaccines and their meningococcal vaccine. ..."
"...reopened the eastbound lanes of Highway 72 East this morning. 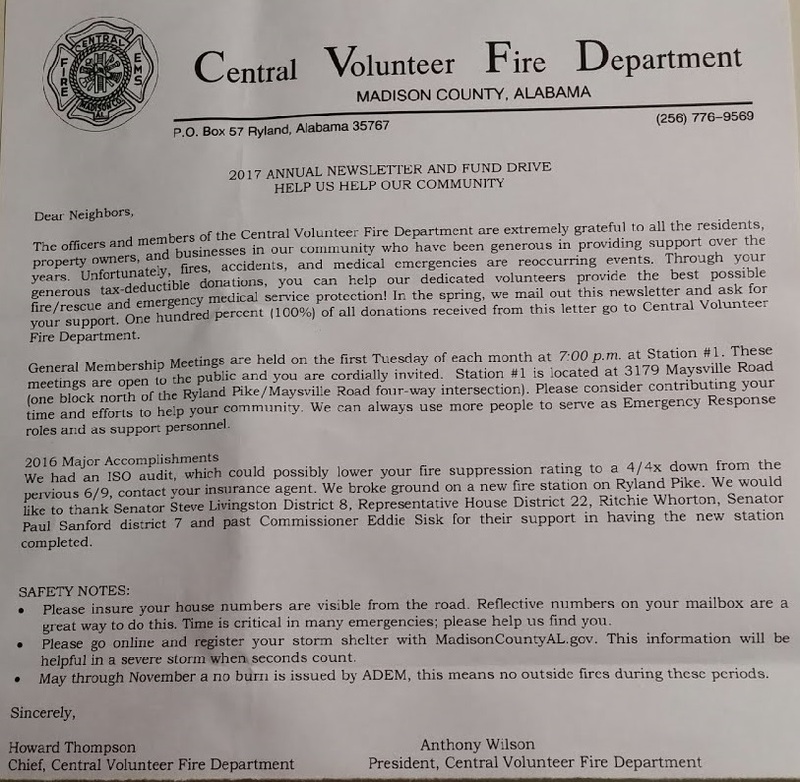 A wreck between an 18-wheeler truck and a sports utility vehicle ..."
Just a reminder that it is that time of year to make donations to the Central Volunteer Fire Department for those being served by CVFD. Additionally, we would like to take this time to 'thank' the volunteer members of this great department. 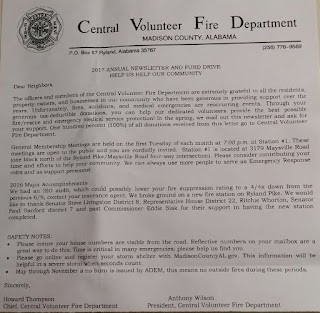 Please click on the image below to read the yearly request from the department.